We’re rapidly approaching GDC in San Francisco, which takes place between March 2nd and 6th at Moscone Center. Our historical GDC coverage is a deep back catalog of games we saw for the first time at the event, and if you’re a TouchArcade reader, prepare for a similar blitz of hands-on videos during the first week of March. 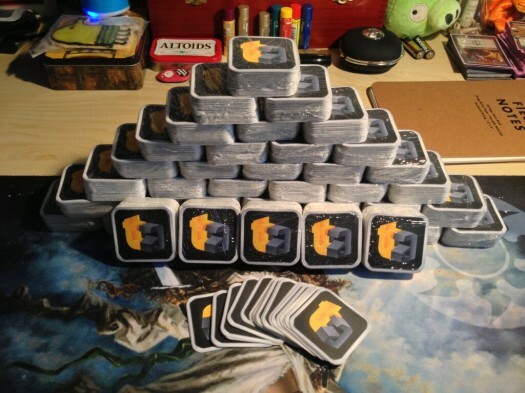 If you’re an iOS developer who is going to be at GDC, or are a TouchArcade fan that lives anywhere nearby, we hope you’ll join us in the TouchArcade GDC Sticker Swap 2015! Alright, so here’s the idea- A few GDC’s ago, Keith from Imangi Studios was handing out 2" x 2" stickers with the Temple Run icon. Everyone saw those and were like, “Whoa, that’s an awesome idea." The following year, we made it a thing, and had a whole party focused around the idea of trading stickers. We didn’t really do anything special for the following GDC, but this year I’ve had tons of requests that we make a big push for the sticker thing again, so here we are. 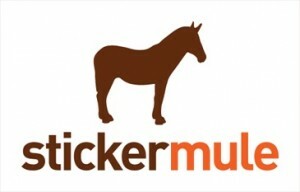 We’ve teamed up with Sticker Mule to offer anyone interested a pretty sweet deal for securing stickers to hand out at GDC. 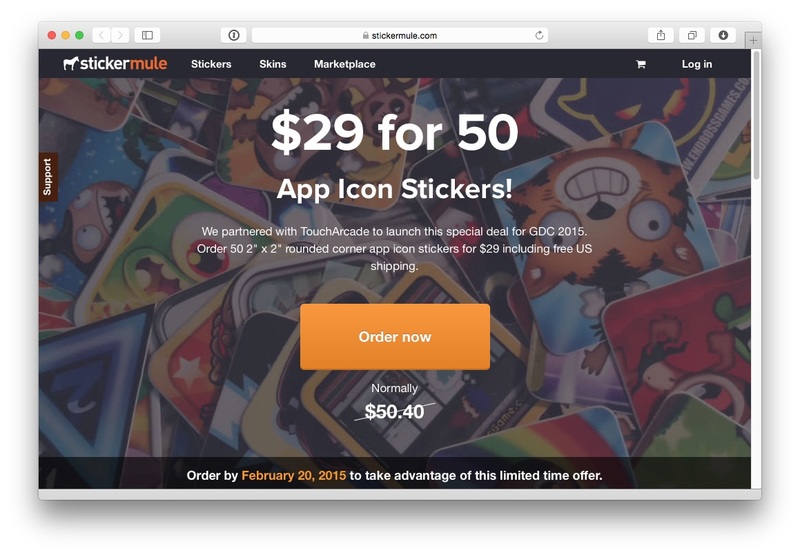 You’ll be able to get 50 of their 2" x 2" rounded corner stickers (Perfect for app icon art!) for $29 with free shipping (assuming you’re in the US, they ship international too). That’d normally run you over $50. Of course, like ordering anything you’re getting printed, things get much cheaper in greater quantity… So while you could order 50 for the $29 promotion, you might as well just order 100 for $37, or 200 for $51! This kind of dangerous logic has lead me to have an entire shoebox packed full of TouchArcade stickers. So, while I’m not going to tell you how many to order, just getting 50 seems, well, you know. It’s also worth mentioning that they make tons of other types of stickers too, and everything I’ve ordered from them has exceeded my expectations. If you want to go wild getting other stuff besides the 2" x 2" app icon stickers made, well, you just do whatever feels necessary. If you’ve already ordered stickers, this coupon is a great excuse to get more stickers, as more stickers is the solution to all problems. Once you’ve got your stickers, the next thing to do is bring them to GDC. Typically developers will have stickers on their shirt, of iPad, or computer, or somewhere else obvious. You need to make it your mission to collect as many different stickers as possible, while spreading your stickers around as much as you can. One interesting thing that came out of this when we first did it was that some stickers naturally were more rare than others, as developers who only got 50 printed obviously are far more careful spreading them around than if you got 1,000 made. Everyone had a Pocket Frogs sticker, but the die-cut Blockheads guy sticker? That one goes straight in the rares page of your trade binder. On a more serious note, we had more than a few people tell us what a fantastic ice breaker sticker trading at GDC can be. It’s always a little awkward going up to someone you don’t know at a convention like this, but if you’re doing the sticker thing you’ve automatically got something to talk about before segueing into nifty Unity tricks or your latest monetization experiments. If you’re not into the idea of hunting down people lurking around San Francisco who might have stickers, we’re throwing a party specifically for everyone to get together and trade… And, you know, hang out with the TouchArcade crew, iOS developers, and anyone else who decides to show up. Also, as mentioned before, if you’re just in the area and love the site, please come by! Bin 55 is just the Marriott lobby bar, because of that they don’t really put aside any special space for us, so just look for the obvious group of game developers. Also, we’ve actually found that our parties are better when we don’t do open bar as the only people there are people who actually want to be there instead of people who just want free beers. As such, if you plan on drinking, and you totally don’t have to, bring some cash to tip the very overworked servers they always have working there when we do a event. If you want to make a GDC meeting request, hold your horses, I’ll post how to do that a little bit closer to the event. For now, just make sure you’ve got our party in your calendar, and tell your friends!